This free-to-play sports title fumbled before it took the field. Now that developers have flooded the App Store with free-to-play kingdom builders and management games, they've turned their collective attention towards other genres. 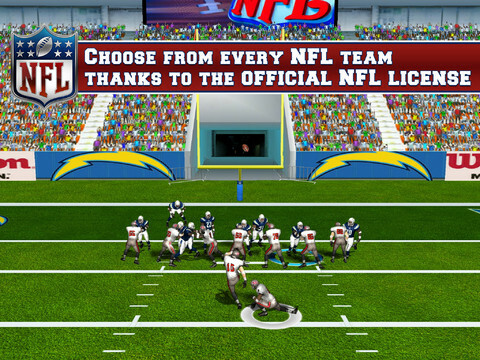 Thus, we have NFL Pro 2013 from Gameloft, a freemium title for iPhone and iPad that we'd care to forget. Bogged down by in-app purchases and one of the silliest first-person perspectives in video game history, this abysmal effort lands with both feet out of bounds. Initially, we expected something along the lines of EA's Madden games, a full-featured product with all the trimmings. That was our first mistake. In going freemium, Gameloft forces players to spend valuable points on the majority of the plays. Once the meter hits zero, you can only throw short passes and hand-off to the running back, which makes winning against the computer almost impossible. Meanwhile, dropping back to pass transitions the camera from a third to first-person view from inside the quarterback's helmet, but you don't have much room to spot receivers, and scrambling is out of the question. Not only that, but for some strange reason, the game will often switch back to third-person, preventing you from making a pass. Sadly, there's no way to switch off that first-person view. Other gameplay issues involve a kick meter we still don't understand (even with the tutorial), receivers getting pushed ten yards or more backwards after a catch and the A.I. making a ton of last second throws just before hitting its QB, passes that conveniently land in the arms of wide-open players. As for the presentation, the game has all 32 NFL franchises (you need to purchase teams, by the way), but not the players. Are you a New York Giants fan? Regardless, get ready to play as/compete against the likes of QB Eli Sunnunk and defensive juggernauts Justin Lekk and Osi Awarore. Wait, what? On top of that, you can forget about individual team stadiums, and the announcing takes us back to the 90s. At this point, we'd settle for NFL Sports Talk Football '93 for Sega Genesis. There's more, including player upgrades and different modes, but we'll stop right here. NFL Pro 2013 is one of the worst sports games we've played in years. If anything, it serves to remind us that despite EA Sports pumping out the same Madden annually, that Madden is by far the superior product. At this point, almost anything is better than this disaster. What's Hot: At least it's free to download. 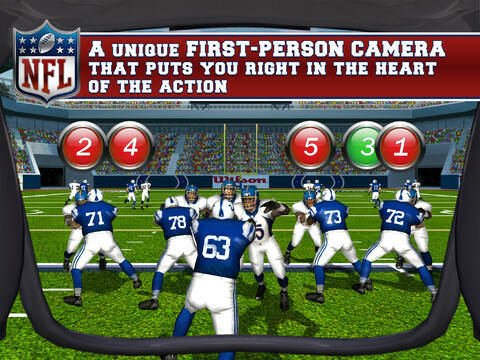 What's Not: Annoying first-person QB perspective, cheap computer, poor animations, spending points to call plays, simplistic announcing, no real NFL players.